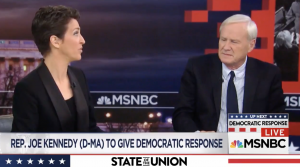 MSNBC's Chris Matthews was outraged at President Donald Trump Tuesday for telling the story of Otto Warmbier's death at the hands of North Korea in his State of the Union address, suggesting it was part of "getting ready for war." With Warmbier's parents watching in the gallery, Trump recounted the death of Warmbier, a University of Virginia student who was detained by the regime while in North Korea and sentenced to 15 years of hard labor. He was returned to the U.S. in June in a coma and died shortly after, having suffered extensive brain damage at North Korean hands. Trump used the anecdote as part of a larger point about North Korea's continued nuclear threat. Matthews sounded irritated as he pointed out that Americans don't care for North Korea, a dictatorship with one of the worst human rights records on the planet. "We don't like them. We've never liked them," he said. "Why did he stoke the fires tonight? Why did he bring out the really tough case of the family losing their kid who was hiking through the mountains there? What was the whole point of that? Are we getting ready for war? What are we getting ready for?" "It's no departure from how he's been for the last eight months toward North Korea," MSNBC host Rachel Maddow said. "He's been threatening, all but promising—"
"Why'd he bring it up?" Matthews asked. "Because he wants a war with North Korea, if you take him by what he says," Maddow said. Matthews noted Trump said in the speech that he didn't want to use nuclear weapons, so "I'm not sure what the plan is."